Thanks to everyone who left supportive comments on my last post. The pink skirt did help me snap out of my funk a bit. Sewing Rules! As soon as I got my copy of Gertie’s New Book for Better Sewing, I started in on the Pencil Skirt. I quickly found the sizing to be awesome. I could cut one size and it fit. Take this into consideration if you’re used to a lot of ease in your patterns. The Big 4 are notorious for the extra ease. Also, the finished sizes are not printed on Gertie’s pattern sheets so make sure you measure the pattern pieces before you choose you size. To be honest, I hardly ever choose a size based on anything but the measurement I take off the pattern itself. Check it out. You might be surprised. 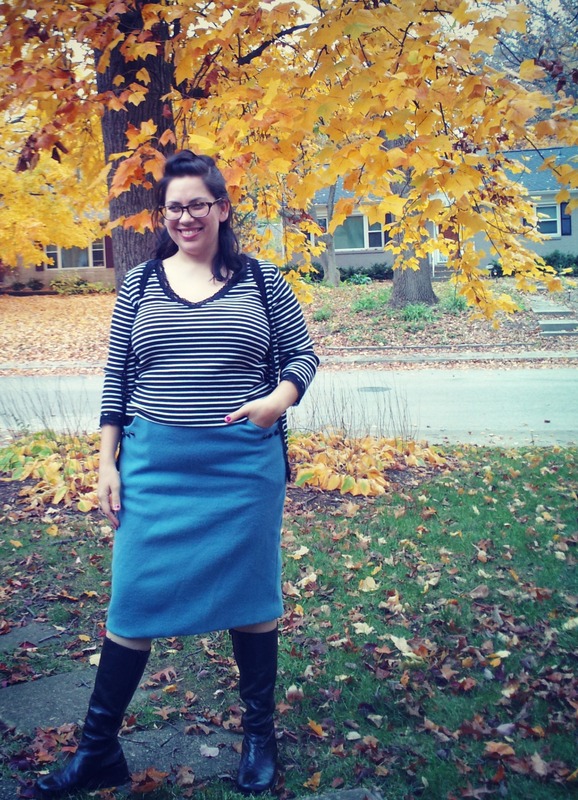 I’ve actually used this pencil skirt pattern four times already. These two skirts are the last two. The first time I used the pattern for my Wonder Woman dress. The second time was with a striped stretch baby cord that I got at Vogue Fabrics almost two years ago. It was so precious to me and I finally used it. A photographer I know took some pictures of me in some of my costumes as well as of me in this baby cord skirt. I’ll be sure to post some of the pictures here once I get them from her. This blue one is made of a super soft wool (that became this lush soft fabric after I pre-treated it). I just had to add some leatherette and leatherette covered buttons…and POCKETS! 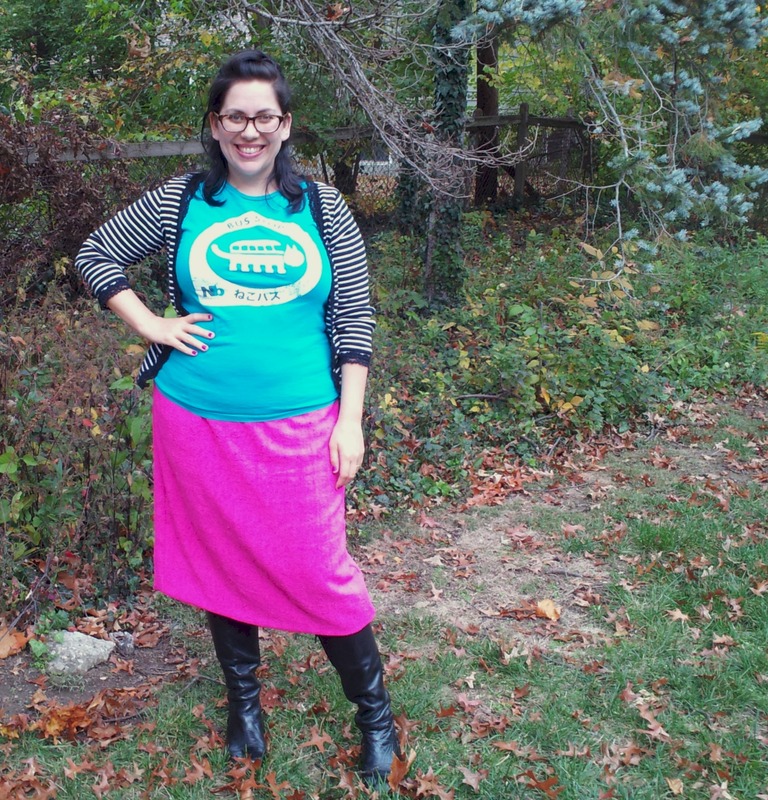 I actually used the pockets and the shaping at the top of the skirt from Butterick 5455 along with Gertie’s pattern. I love this skirt. and with my tank tucked in which I prefer to the tank untucked. Yeah, and these are stripes going the “wrong way” which I also love. I actually think a well fitting bra can make you look smaller, more lifted, younger, thinner, etc, than the clothes that go over it. If you know me at all, you know I like wearing skirts and dresses with chucks, t-shirts with pretty skirts and really anything I want to wear, I usually wear. I’ve always enjoyed this freedom. This skirt is both a reflection of that and my need to wear more color this winter to contrast with the drab grey that assaults us. I actually cut a size bigger for the pink silk skirt. Mostly because the blue wool one is great when I stand but not so much when I’m sitting. 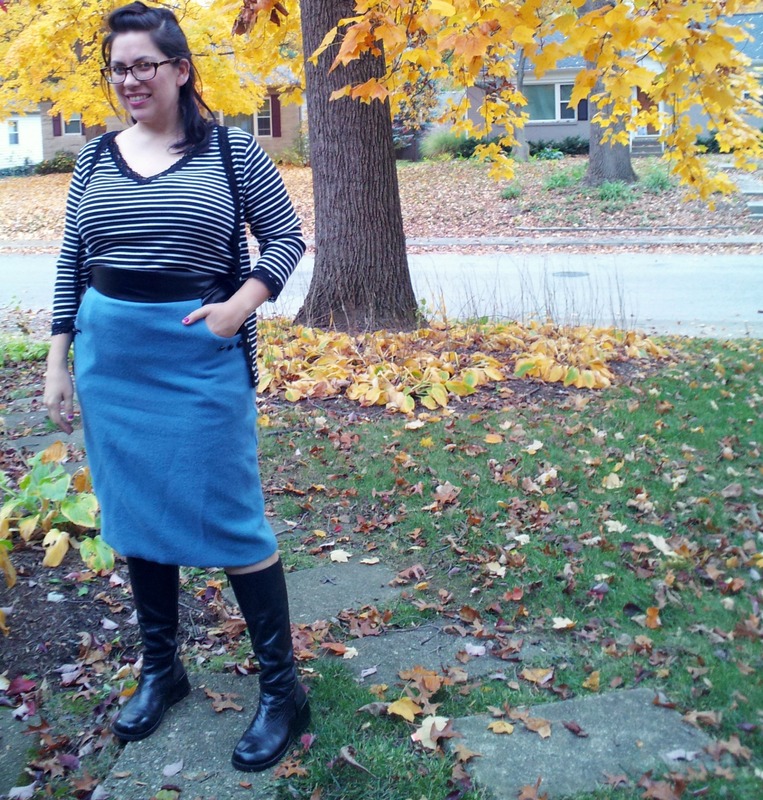 Let’s just say I love that the stretch in the baby cord skirt makes for a very nice skirt. It’s fitted but eases when I sit. I did end up pinching out some of this ease I added to the pink skirt and I still feel like it’s a little baggy. All in all, I love these two skirts. I know I’ll make another one (or two) this winter. Perhaps in a wool suiting (with stretch, most likely) or something yummy from The French Seam here in town. These skirts are really a great first project for Gertie’s book. They’re easy and very striking. Ok. Pencil skirt love anyone? Its such a great shape on you, you need to keep up the variants and dazzle us! Love them both! I made myself a similar pink pencil skirt a couple years ago – it looks the same color as yours from a distance but it is a subtle houndstooth fabric in cherry and magenta when you see it up close. I think it’s home decor fabric (not really sure because it was in a bag of fabric someone gave me). And you are so right! – it is all about the proper undergarments. You can’t expect something to look good on top of something that fits badly!